Leading Exporter of electrical vaporizers, long distance transportable tankers, co2 cylinder test bench, steam heated vaporizers, air cryogenic vaporizers and flue gas analyzer from Delhi. Here, air (atmosphere) is blown into the set of finned tubes through which liquid CO2 is circulated for evaporation. Two sets are generally used. When one is used then it gets forested due to the low temperature of liquid CO2 starts evaporating. The previously used tube gets ready once again. By this process, change over takes place at a regular interval. This process continues to give the continuous stream of evaporated CO2 gas. Long distance gas transportation tankers have a storage tank, designed in compliance with ISO standard. The storage tank is housed in a frame. All the containers are made to BS-5500. 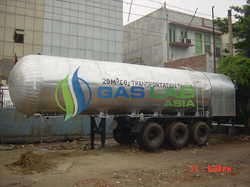 These gas transportation tankers are suitable for transportation by road, ship or rail. 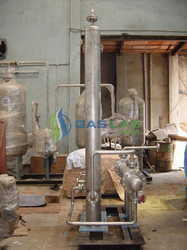 SS Gas Lab CO2 cylinder testing bench is developed as per the international regulations. Apart from cylinder testing, the hydro pressure pump and measuring expansion apparatus / fixtures can also be supplied. With this testing bench, the expansion of the cylinder at the maximum pressure and within the allowable limit can be measured accurately. A special torch is made with which inside of the cylinder can be checked. The testing bench is is hydraulically /mechanically/manually operated and it is specially designed to hold the cylinder securely without any damage.Standard configurations of the SSGLA cylinder test stations are listed below:Standard configurations of the SSGLA cylinder test station is done in compliance with the specific industry and equipment requirement. The configured parts are developed from superior quality material.Salient featuresSafe and sturdy structural design of S S Foundry CO2 cylinder testing bench have proven beneficial for their long life. These can be made compatible with distinct equipment, on which testing is to be done. Further, the precision configuration of our testing equipment is done to benefit the requirements of distinct equipment. Some of the salient features of our CO2 cylinder testing bench are specified below:Test pressure can be maintained upto 350 kg. / cm² & above.Sturdy bulldozer type construction.Configured with heavy duty gear box.Self oiling arrangement.Complete enclosed mechanism.Configured with large pulsation dampener.Leak proof and has a long life.Highly economical.ApplicationsCO2 cylinder testing bench allows the testing of a wide range of precision equipment, installed in distinct industrial units. The sturdy construction of our testing bench aids efficient and accurate testing of different equipment. Depending upon the specific requirements of our clients, we can custom configure our testing bench, for the complete satisfaction of our clients. AncillariesTipping Jig Sturdily constructed and designed for easy tipping and emptying of the cylinders, after the necessary tests are performed. Test Vice Hydraulically operated, the test vices are used for holding the cylinders securely, without any damage. Cylinder valve removal spanner allows in removing tight valve. Wherever steam is available at the site e.g with bottlers, breweries etc., the steam evaporator is a very cost-effective system of evaporation of liquid CO2. 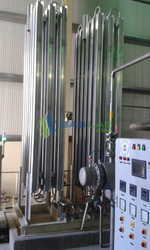 The steam heated vaporizer is a twin tube heat exchanger. Liquid CO2 is in the center tube and steam is in the shell. Steam evaporator eliminates the use of expansive electrical energy, which is required on other types of evaporators. The principle behind working steam heated vaporizer is that the sensible heat of steam is used to vaporize liquid CO2 and the condensate is automatically removed. The capacity of the evaporator can be designed to most sufficient heat transfer. Shut off valves, safety valves reduction valves and filters are provided to ensure trouble free working of the equipment. The steam trap is also provided to economize on the consumption of the steam and automate the removal of condensate. Air Cryogenic Vaporizers consists of two or more finned aluminum elements, manifold together around seamless S.S high-pressure tube and mounted vertically. Each element features eight fins that provide high capacity performance and faster defrosting. Standard element heights have approximately five sq. ft. of external heat exchanger surface per ft. of length obtaining maximum surface per linear foot. There are no moving parts and no additional power or utilities required. These units are especially economical and maintenance free, yet highly efficient for vaporizing gases or fluids. Air cryogenic vaporizer has element spacing substantially greater than conventional; natural convection ambient vaporizers and therefore permits continuous operation without defrosting characteristic of conventional units. Flue gas analyzers used for analyzing the percentage of CO2 in flue gases. This flue gas analyzer is endurable to temperature range from -35°C to 65°C and offers a scale accuracy within .5 to 1% of scale reading. Special purity measuring burette for gaseous CO2 exactitude of measurement up to .1% by volume. 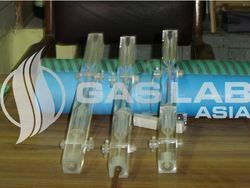 SSGLA CO2 manifold system enables the consumers to draw CO2 gas at one place, and thus mishandling of the CO2 cylinders is avoided to a greater extent. All this eliminates the carriage of individual cylinders at different locations, where MIG welding sets/ user system are located. 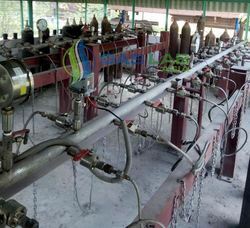 A special system is incorporated in the CO2 cylinder manifold system due to which low pressure gas (required by the user) can be sent through the pipeline. SSGLA CO2 manifold system is properly configured, inter-locked, safe and it ensures trouble free service. CO2 is transported in the cylinder or storage tankers in liquid form and is evaporated and expanded to lower pressure. During this process, CO2 is cooled, and it results in pressure oscillation. Advantages of SSGLA CO2 cylinder manifold system are specified below: No exterior heater / steam required.Clean system.No full time operator required.No internal freezing.No pressure oscillation.Clean CO2 can be obtained as the impurities get filtered off.CO2 can be supplied without interruptions, when the cylinders are changed.Economical on energy, CO2 and time.SSGLA manifold system supplies the gaseous CO2 at desired outlet pressure. We can install up to 4 outlets with 4 different outlet pressures, in compliance with your requirements. Gas outflow pressure can be varied between 1 to 16 bars. The time required for installation of the system is minimum. 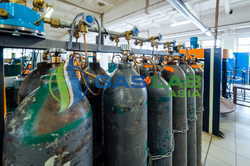 The CO2 gas can be handled in pure & moisture free state, as per International Manufacturing Code/ ASME Standards. Distinct features like dryers and oil filters can be configured in the system at extra cost, if the gas contains moisture or oil. Apart from all these, an alarm system can also be configured to indicate low pressure in cylinder.